At London Taxi Advertising we’re confident that you’ll fall in love with your very own branded cabs. As a result, we offer our clients the chance to take home a free souvenir of their campaign in the form of miniature models. The end of your campaign doesn’t have to be the last time you see your taxi – mini models are the perfect way to remember the result you’ve achieved and the great impact you’ve made on the streets of the UK. Show them off to clients, stand them proudly in your office or stores and get people talking about your fantastic London Taxi Advertising campaign. The perfect memento for your office! A completely free gift from LTA to you! 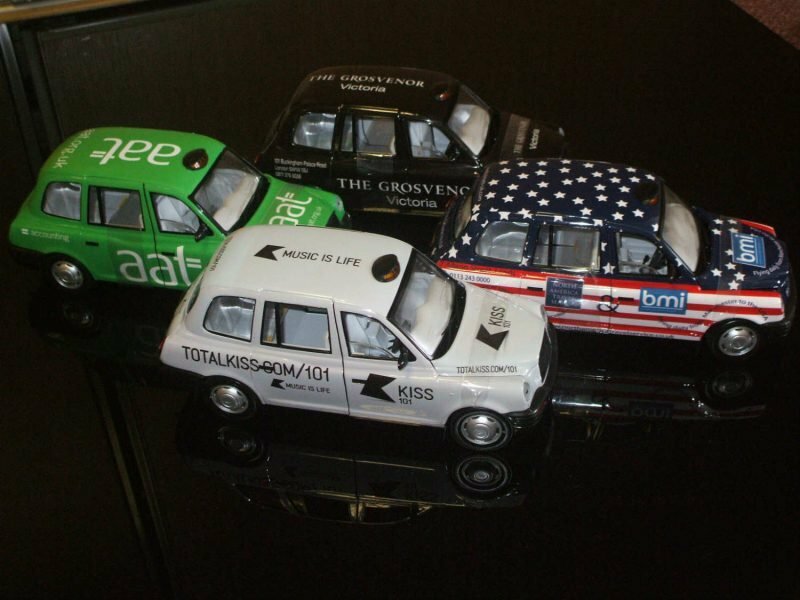 Our detailed miniature models are available upon request, and are a completely free gift from London Taxi Advertising to help you remember your campaign and the work you’ve done with us. Multiple scale models – for those looking for a larger or smaller version – are also available at an additional cost. These post-campaign souvenirs are available from our London Taxi Advertising sales team. Simply get in touch with your representative to request one of our fantastic miniature models! London Taxi Advertising were very helpful when planning our Cool Beans Tour. Our branded taxis were key to creating an impact, we were very pleased with the look of the final product and the service provided by London Taxi Advertising was excellent. Marketing Manager at Food Brands Group Ltd. The team at LTA are a pleasure to work with. They always find us the inventory we want, when we want it and at competitive prices. They are responsive and reliable, and that’s really important to an agency like Zest. I would recommend them to anybody. Mirabelle have booked campaigns with LTA for many years, forming a successful partnership while executing the successful promotion of many of our airline and tourism brands. The service they offer has always been of the highest order. We look forward to many more years of inspirational and aspirational campaigns. We work closely with Tunnock’s in marketing their brands across the UK and have advertised with London Taxi Advertising for the last 4 years. Each time they’ve been a pleasure to work with and Tunnock’s have been delighted with the results. The team have brought the brand to London in style and I cannot speak highly enough of the service they’ve provided. Efficient, friendly and helpful, we’ve forged a strong working relationship with LTA. Visit Buffalo Niagara worked with London Taxi Advertising to promote the Buffalo Niagara region to U.K. travellers in Fall 2015. London Taxi Advertising was professional, responsive and easy to work with. When we hired our taxis for a day of picture taking around London the drivers could not have been more pleasant and helpful. This high profile advertising opportunity generated significant interest on social media and our funders and partners were pleased to see our agency use this creative approach to marketing and promotion. We worked with London Taxi Advertising in 2015 for our Amazing China Photo Competition campaign during the Chinese President's unprecedented visit to the UK. Taxis decorated with the beautiful photos served as mobile exhibition platforms across London and drew the attention of not only the media but also brands in China, which have been since asking us how to advertise their products and services on London taxis. From booking to being on the street the team at London Taxi Advertising were efficient and friendly offering up ideas on how to make the most of the campaign. Happy to use them again for future campaigns. London Taxi Advertising put the “easy” brand on London taxis as part of our marketing strategy, creating a fusion of the classic and iconic alongside one of the best known names in the European marketplace. Recommendable service. It has been a pleasure working with London Taxi Advertising on our London Glory campaign. Their expertise and extensive knowledge around brand activation is second to none and made the whole process run smoothly from start to finish. Accommodating throughout and executed with complete professionalism, we would be sure to recommend.